As the expiry of the previous support scheme for renewable energy in Denmark resulted in a significant expansion with land based wind energy in 2017, we hold our breath to see how the annual technology-neutral wind and solar tenders for 2018 and 2019 will pan out in the country. While we wait, we can look to Germany and see what happened there at its first attempt. According to Wind Power Monthly Germany’s first joint technology tender has been branded a “failure” by industry associations after only solar projects secured all of the capacity. Germany’s Federal Network Agency (BNA) reports that in a 200 megawatt (MW) auction in February, 18 bids were made for wind power projects, with none of them being successful. Solar projects won the whole thing with 32 contracts at values ranging from €39.60/MWh to €57.60/MWh! 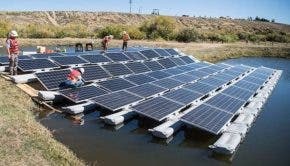 In a response to the auction results, the Federal Solar Industry Association (BSW-Solar) and the German Wind Energy Association (BWE) found the joint tenders as “unsuitable” for encouraging the build-out of the two technologies that would otherwise help stabilize the production of electricity from renewable energy. The BNA received bids totaling 395 MW for the 200 MW of available capacity, and Jochen Homann, the president of the BNA, agrees that a mix of different technologies is essential for the success of the energy revolution. A couple of joint onshore wind and solar auctions are planned for each year in Germany between 2018 and 2021, after which the process will be evaluated. Renewable energy expansion is certainly accelerating whereever you look, but it might be a good idea to coordinate the effort at the government level. While there is generally nothing wrong with having the lowest bidder win, there is a good point in encouraging overlapping technologies to play an equal role. If for nothing else, then at least until large-scale energy storage is feasible. Or — some might argue — until everything eventually goes off grid or micro-grid. Here on CleanTechnica we often discuss whether solar or wind will win in the long run, but a pragmatic approach with currently available technologies would in any case be preferable in contrary to dirty power.